Bluff, Utah, the little town with the great can-do attitude is hosting the Annual Bluff International Balloon Festival on January 13-16, 2011. It started with one balloon and oodles of volunteers. We still have the volunteers, a tremendously supportive business community, and the nicest, most experienced group of balloonists imaginable. Why do they return year after year? Simple. Bluff provides some of the most beautiful, unencumbered red rock flying in the Southwest. 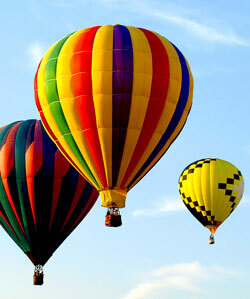 The big, colorful balloons are flown by a big, colorful cast of characters with hearts as large as their flying orbs. Watch as their colorful balloons kiss the red rock bluffs! Fun lovers of all ages will enjoy this very friendly event!